Today (May 27) is WordPress’ 10th anniversary! (Technically speaking, today marks 10 years since the first WordPress release). In that time, there have been 79 WordPress releases (19 of which were major releases that were named in honour of a jazz musician). 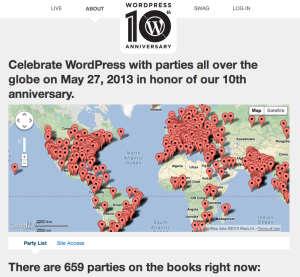 To celebrate, there are over 650 WordPress 10th Anniversary parties around the globe. So be sure to get along to one of them and spread the WordPress love. Also, be sure to check out the anniversary posts from WordPress co-founders Mike Little and Matt Mullenweg. Today (11 March) is my 27th birthday.